Local elected prosecutors are backing a proposal to ask voters if they want to reaffirm or toss the state’s rarely used death penalty. Tina Robinson, in Kitsap, and Michael Dorcy, in Mason County, both say they are in favor of the death penalty, but are also supportive of the proposal from the Washington Association of Prosecuting Attorneys. Robinson said she has concerns about how the death penalty is carried out, the length of time it takes to carry out the sentence and the effect that has on families. “We want to hear from the citizens of Washington,” Robinson said. Robinson has considered pursuing the death penalty once during her term – she took office in January – for the case of Geraldo DeJesus, accused of killing his ex-girlfriend and her roommate’s toddler in March. After consulting with family members and survivors, Robinson opted not to pursue it (DeJesus has pleaded not guilty is currently scheduled for trial Feb. 8, 2016). Dorcy got closer in the case of Charles Longshore, convicted in 2014 of killing two people in Shelton, but after a lengthy and intensive seven-month process, opted not to pursue it, a decision he believes was right. Dorcy has been in office since 2010. The proposal is for a referendum, which means voters would have a chance to weigh in after the Legislature and governor approve it, as opposed to an initiative, which is placed on the ballot after a certain number of signatures are gathered. Lawmakers could consider the matter when the Legislature meets in January. Although the state’s current law has been on the books for 34 years, it is reserved for specific types of murder — aggravated first-degree murder — and has rarely been used. Since voters approved the death penalty in 1975, five people have been executed in Washington state. Currently there are nine people on death row in Washington. The longest serving inmate on death row, Jonathan Gentry, was sentenced to die by a Kitsap jury in 1991. For context, since 1976 the state of Texas, where the death penalty is used more than any other state, has executed 530 people. Although the process is intensive and expensive, a factor both Robinson and Dorcy say is something they consider, it is not the “driver of the bus,” as Dorcy put it. Tossing the state’s law, if voters choose to do so, might be fairly simple. Presumably the sentences of those on death row could be commuted to life without parole and as of the issuance of the association’s statement there were no pending death penalty cases in the state. Keeping the death penalty on the books, however, doesn’t necessarily mean inmates sentenced to death will be executed any more quickly nor does it mean it would be used more frequently. First, Gov. Jay Inslee has imposed a moratorium on executions. If voters elected another governor, however, they would not be required to maintain the moratorium. However, those sentenced to die have numerous appeals available to them, state and federal, some mandatory. There is also the matter of method. Washington state, historically, has used hangings to execute people. Lethal injection has been an option since 1986, and was used in the past three executions, the last one taking place in 2010. However, the companies that have made the drugs used in lethal injection are from Europe, and object to capital punishment, and have refused to import them to the U.S. Some states have found substitute drugs, but there have been reports of those drugs not working as intended. And Washington did not have any of the accepted drugs on hand when Inslee declared his moratorium. Below is the statement, issued from the office of King County Prosecutor Dan Satterberg. The prosecuting attorneys of Washington State overwhelmingly believe that the people of the state should vote on the question of whether the state should retain the death penalty as an option in cases of aggravated murder. As the elected officials entrusted with the fair administration of capital punishment in our state, we call upon the Governor and the Legislature to place a referendum on the ballot next year seeking guidance from the voters about this significant public policy issue. It was forty years ago, in 1975, that the people of the state approved Initiative 316, which created the death penalty in our state. The previous death penalty scheme had been found unconstitutional by the US Supreme Court in the Fuhrman v. Georgia case in 1972. The language of the initiative was amended by the Legislature in 1981 to comport with the 1981 State Supreme Court decision in Frampton. For the past thirty-four years Washington prosecutors have pursued capital punishment in the most heinous murders committed in our state. During that time, prosecutors sought the death penalty in 90 of 268 cases where it was a possible sentence. Jurors returned unanimous verdicts of the death penalty in 32 of those 90 cases. The 32 death sentences that have been imposed under the current statute have resulted in the execution of five men, three of whom were “volunteers” who instructed their attorneys to not pursue appeals of their convictions. Two men were executed following a lengthy period of appeals: Charles Rodman Campbell in Snohomish County, executed in 1994 for three murders committed in 1982, and Cal Colburn Brown in King County, executed in 2010 for a murder committed in 1991. Nine men currently reside on death row, awaiting more appellate process. Eighteen men who were sentenced to the death penalty had their sentences reversed by appellate courts and their cases were ultimately resolved without imposition of the death penalty. Most of the people in the state of Washington today did not participate in the election forty years ago that established our state as one of 31 U.S. states with the death penalty. The citizens of Nebraska will vote on the repeal or retention of the death penalty in that state next year. Washington State voters should have a similar choice. Prosecuting Attorneys act daily as ministers of justice exercising the power and authority of the state in the name of the people of the state. Prosecutors want to know that when we embark on the long and difficult process of capital punishment for the worst crimes inflicted upon our community that we are doing so with the support and approval of the people we represent. 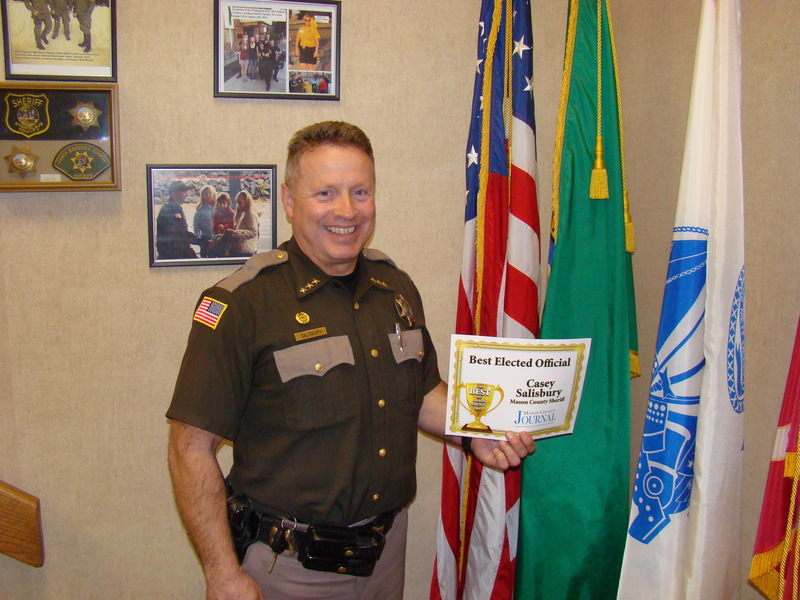 A spat between Mason County officials on what constitutes appropriate use of tax dollars went public Thursday, when the county public works director hit “reply all” on his criticism of a press release from the Sheriff’s Office lauding the sheriff for an award. 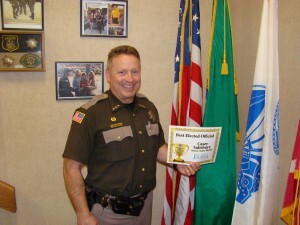 Included in the release was a photo of a smiling Salisbury holding the unframed certificate, along with a direct quotes from the sheriff which contain a number (5) of exclamation points. Later in the day, Adam responded with another statement from Salisbury, lamenting the response as “unfortunate,” and cited a line from the county “mission statement” that says the employees of the county are the foundation on which county services are provided. It is also unfortunate that people, who do not live in this community, do not support the community the way I do. The friction between the officials was aired before multiple news outlets in Western Washington, including Seattle television stations and daily newspapers such as the Sun and others from Port Angeles to Olympia. Mason County has had other interesting email incidents in recent months. In August, Adam accidentally sent out a restricted bulletin about a dangerous suspect wanted by police. Realizing the error, Adam sent out another note to the media contact list, asking journalists to destroy the email, claiming that publishing it “could cost an officer his or her life.” In case there was any confusion about what email Adam was talking about, he sent the restricted email again. A Bremerton man sentenced to 30 months in federal prison for terrorizing a group of gay men on Capital Hill in January has a history of drug dealing. Troy Deacon Burns, 38, pleaded guilty in August for violating the Matthew Shepard and James Byrd Jr. Hate Crimes Prevention Act. Burns has convictions in Kitsap Superior Court for violation of the uniform controlled substance act from when he was caught in 2009 selling cocaine in the East Bremerton Fred Meyer’s parking lot to a police informant. He also was caught with about 2/3 of a pound of marijuana in 2007. 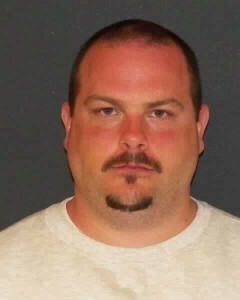 He also has a juvenile court conviction from 1994 for stealing a car, according to court records.